Listen, I’m all about investment pieces that can last you many seasons…or a lifetime. But not every piece in our closets should be an investment, especially because trends are changing so often. 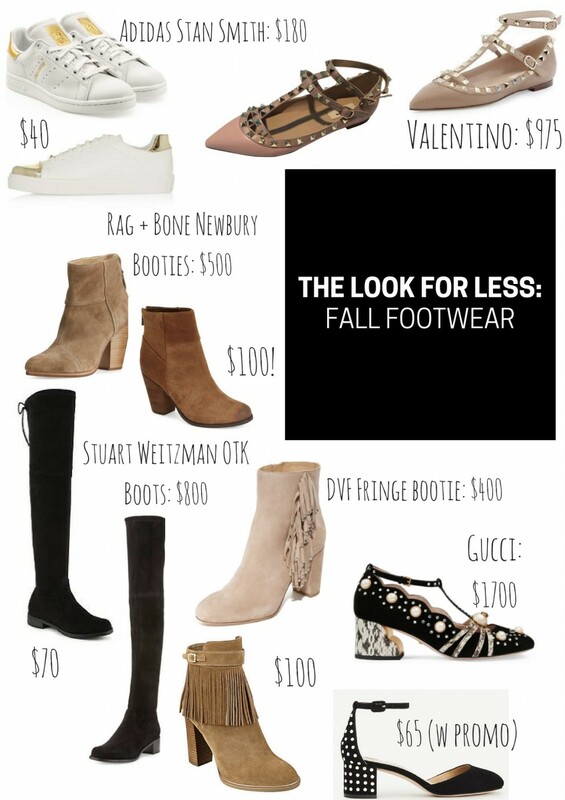 So let’s leave investment pieces to the more timeless wardrobe staples, and look for the bargains on seasonal, trendy pieces! Below you’ll find a collage of hot items for even hotter prices. Shop from the links to get designer-inspired threads for a fraction of the price! Don’t give into peer pressure here and get the Adidas tennies, because it could end up costing you! Topshop for the win here. I’m practically adding these Valentino-inspired shoes to my cart as I write this! They’re incredible – we all need a pair. These booties could NOT be more similar! Save $400 by getting the Chiang Arturo pair. I just happened to find a pair of these Unisa boots at Marshall’s last fall season, and I ended up getting two pair. They’re so flattering on the leg and I even had people ask me if they were the Stuart Weitzman version! Fringe is definitely still in the forecast for the fall, so make sure to grab a deal on some classic, heeled fringe booties. I’m not sure who can’t OBSESS over these Gucci heels…but also…who can’t cry over the price?! Maybe Beyonce. That’s why I was thrilled when I found this adorable pair from Ann Taylor with the pearlized heel. They’re perfect for the fall and especially for some holiday parties once we get into the winter!